We are little Verbal creatures. Each of us with different features. The first of us in glass is set. The second you can find in jet. The third is trapped in tin. The fourth is boxed within. Now the fifth may try and hide, but it can never leave your side. An adopted sibling we also have but, he only appears when pigs fly. What are we? 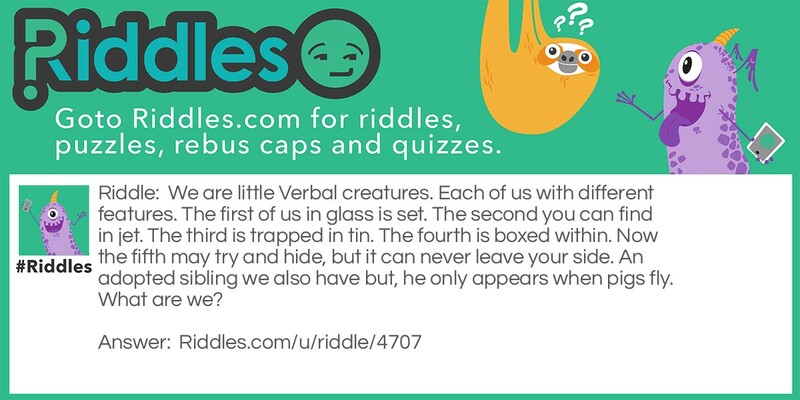 The vowels A, E, I, O, U and sometimes Y.
Verbal Creatures Riddle Meme with riddle and answer page link.